Le Hatley Restaurant at Manoir Hovey, a lakeside Relais & Châteaux property, reflects the passion for the region's history, its bounty, and its natural beauty. 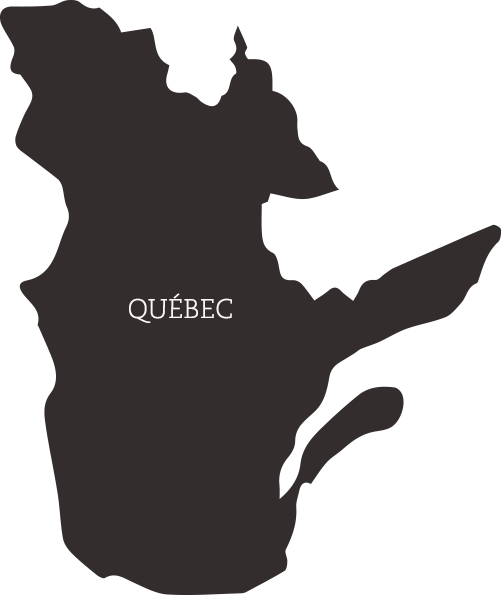 The culinary philosophy celebrates the ingredients that are abundant in Quebec's rivers, lakes, forest and fields. The abundance of birch trees at Manoir Hovey makes it ideal for birch syrup and vinegar production. Le Hatley is quite possibly the only restaurant in Canada to engage in this practice. The nutrient rich St. Lawrence River running through Quebec to the eponymous Gulf provides an abundant array of Seafood and Shellfish such sea urchin, lobster, gooseneck barnacles, scallops and more. Francis and his team are passionate about foraging on the property grounds. In season, you are invited to follow them and learn about wild edibles. In addition to the abundant local production of everyday organic produce, Le Hatley’s menus are also enhanced by Quebec Sea Plants in summer months, such as Sea Asparagus, Sea Spinach and fresh Seaweed. Chef Wolf is enthusiastic about a variety of locally raised free range birds, also from a local Farm Au Pied Levé. Examples include Guinea Fowl, Goose and Wild Turkey. Another true highlight of our menus is the exceptional Foie Gras from La Canardière. Notable products from this season are house made Winter Harvested Apple Vinegar as well as other staples that come directly out of our Birch and Sumac Vinegar cellar and many in house dried products such as mushrooms, dry seaweed, sea lettuce, root vegetables, winter squash and the Chef’s own winter stored carrots. 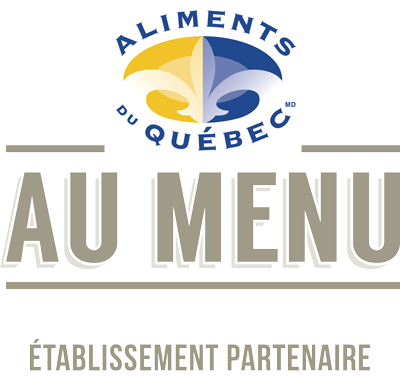 Boasting the local bounty of the province of Quebec, growing, foraging and picking only what is needed, working closely with local farmers and producers, a dinner at Le Hatley is truly a unique culinary experience. Sustainability is an integral part of what we and our team accomplishes every day. Menus are composed with a strict and passionate respect of what each season has to offer, in order to leave the smallest footprint possible. We try to use all of our ingredients from head-to-toe so as to avoid the waste, whether it is for the meat - beef, poultry, lamb, venison - or for the produce. Le Hatley Restaurant at Manoir Hovey is a unique and romantic dining concept showcasing innovative cuisine. To ensure you experience it fully, we recommend that children be 5 years and older at dinner time. 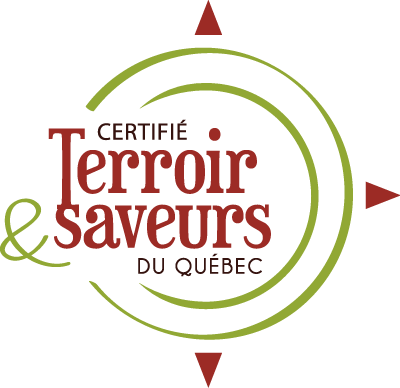 We introduce the best that the Canadian and Québec terroir has to offer through 8 courses - a true culinary discovery. Breakfast is included in all our packages, and also available to visitors at 40$ per person, 28$ for the children under 12 years old (plus taxes and gratuities). 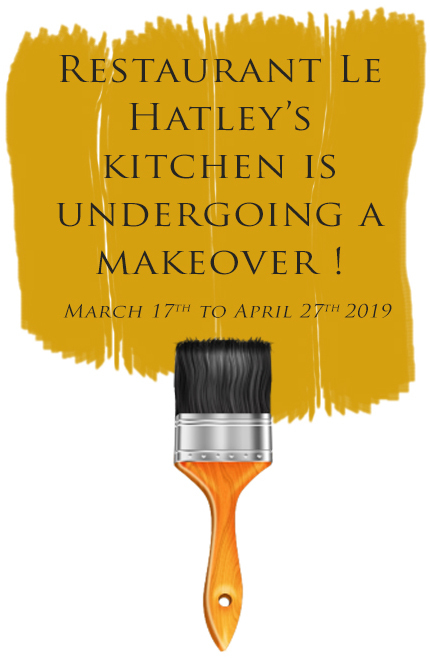 From March17th through April 27th, Le Hatley's kitchen is undergoing a makeover! With our new team in place, we have decided to modernize our facilities in order to offer our guests a gastronomic experience of the highest quality! Breakfast, lunch and evening services will be served at the Tap Room during this period. Visit now Le Tap Room page to discover our brand new evening table d'hôte menu created by our chefs! Please note that exceptionally starting March 17th through April 27th 2019, dinner service will be served in Le Tap Room.Visit now Le Tap Room page to discover our brand new evening table d'hôte menu created by our chefs! Please note that exceptionally starting March 17th through April 27th 2019, dinner service will be served in Le Tap Room. Unfortunately during this period the discovery menu will not be available. Please note that starting March 17th through April 27th 2019, breakfast service will be served in Le Tap Room. The regular menu below will be offered. Warm and enchanting hospitality combined with wonderful cuisine and wines is the experience that awaits all guests discovering and returning to Le Hatley restaurant. 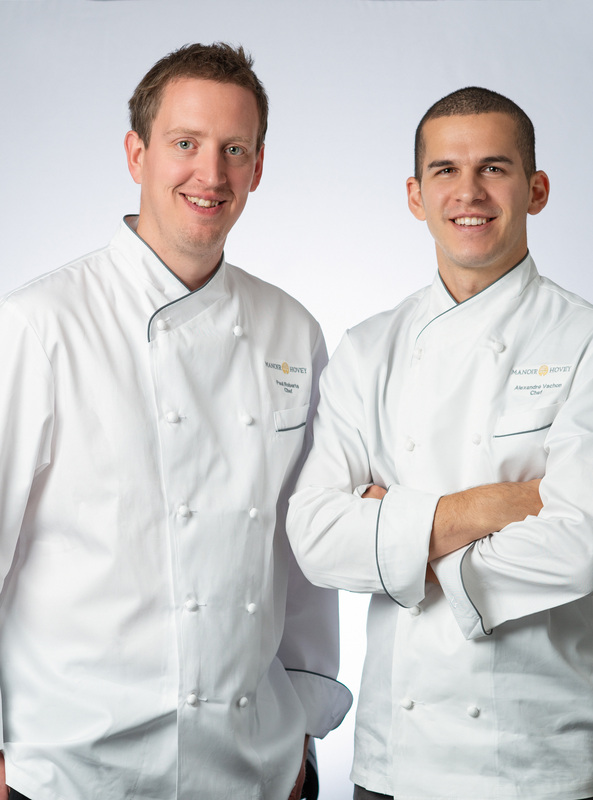 Our dining staff will guide you through an unforgettable personalized dining experience. You will discover the finesse and subtlety of our unique wine and meal pairings or the elegant flavours of some local ice products to pair with our unforgettable cheese trolley. Helping you discover the flavours and local history of the region or even recommending the local attractions is always my pleasure as a native of this beautiful region of Quebec I thrive on sharing my passion for the area and Le Hatley Restaurant. View updated service hours on Le Tap Room page.